Patrick Brady, who was born in Ireland in 1881, operated a saloon as early as 1918 at 938 North 3rdStreet. He had come to America in 1904, and became an American citizen in 1910. After applying for a marriage license around 1913, on February 1, 1915 Patrick Brady was united in marriage with Mabel L. Weidenhammer in Berks County PA. Born in 1885 in Kutztown PA, she was from a large family who lived primarily in Berks County. Mabel Brady was the daughter of Cyranus K. Weidenhammer, who was the first cousin of Oscar B. Weidenhammer, who operated a bottling business near the saloon, at 50 York Street from 1913 through his death in 1932. Already the owner of the saloon at 939 North 3rdStreet, Patrick Brady remained in business by operating a restaurant at the address once Prohibition was enacted in 1919. Patrick Brady passed away in 1927, leaving a wife, Mabel Brady, and three children, Patrick, Mabel, and Harold, all under ten years of age when their father passed. The Brady's oldest child, Helen, had passed away during the 1920s. At the time of the 1930 Census Mabel Brady, still owned the property at 938 North 3rd Street. Mabel Brady continued to operate the business there through at least 1931. At some point prior to 1935, she sold 939 North 3rdStreet to Mary Frank, and moved the business to 245 Erie Street. 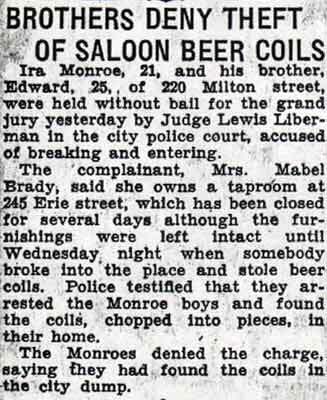 Mary Frank and her associate, Clem Bridgeman, operated a saloon at 939 North 3rdStreet for a short time before losing their liquor license in 1935. Mabel Brady had closed for renovations for short time during the summer of 1936, and she does not appear in the 1940 Directory as operating a tavern at the address. By 1947 the bar was gone. 245 Erie Street was the headquarters of the International Fur & Leather Workers Union Local 206 CIO, whose members worked at the various leather factories that were located nearby, such as the Allied Kid Company, Cook's Inc., The Keystone Leather Company, and the John R. Evans & Company. Mabel L. Brady passed away in Camden NJ on Aporill 11, 1957 at the age of 72. Thanks to Stanley Weidenhammer for his help in constructing this page.